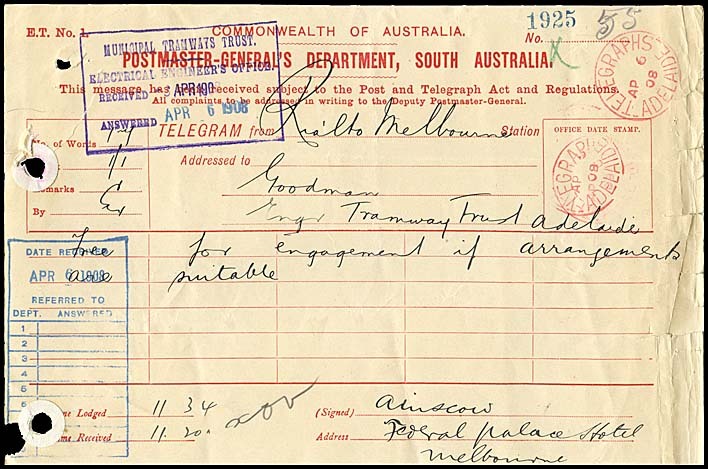 South Australia - Interim period: 1901-1917. Heading and notes: Form number E.T. No. 1. Has standardised interim period heading with State name. Message area: 30 boxes in 6 rows of 5. Colours (text & form): Red on buff. Size of form overall: 143 × 223 mm. Rialto, Melbourne to Telegraphs Adelaide. message area has seven faint lines. Previous SA Delivery form (SI-DO-2). Next SA Delivery form (SI-DO-4). Overview page for all South Australian Interim forms.